As the debt ceiling lunacy continues, and the rabid Tea Party factions continue to become more and more unhinged, placing the United States’ full faith and credit in danger, and the economic stability of the country at risk, all this while American servicemen and women continue to fight and die in Iraq and Afghanistan, the President should give the Republican Tea Party (GOTP) controlled House until midnight on 1 August to grow up and pass a spotlessly clean raise in the debt ceiling or he should instruct the Secretary of the Treasury to do so under the 14th Amendment of the Constitution. This is not something that should be considered at any other time, but our country is still at war. 278 Americans have given their last full measure of devotion while the morons on the right have postured and paraded around. 46 have died in recent weeks while Speaker John Boehner pontificates and loses his grip of control. Leadership requires leading and right now he doesn’t have it. If the President raises the debt ceiling, without the approval of Congress, the GOTP will scream bloody murder and some will cry out for impeachment, while the talking heads (Limbaugh, Hannity, et al) will absolutely come unglued screaming that it’s a takeover, that the socialist dictator has finally made his move, blah, blah, blah; but if the President does this stating to not extend the debt ceiling, while the country is still at war, would be unacceptable and would weaken the nation’s economy when it can ill afford to be weakened he paints the GOTP as unpatriotic, as not caring for either the welfare of the nation or for its military; he comes across as a strong President and as a strong Commander-in-Chief. 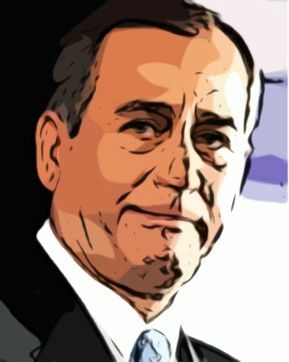 Boehner has no control of his caucus, and Majority Leader Cantor has only an illusion of power, because who can lead a rabble? As for the good old boy from Kentucky, Senate Minority Leader Mitch McConnell has already openly declared his top priority is to defeat the President and prevent him from having a second term, so he’s proven where his loyalties are, and they’re not to the nation, they’re to his party. The President has time to let the GOTP come to its senses, but he needs to back away and tell them flat out they have until 1 August and then he acts. Let them stew in their own juices, and let them fail, while saving the credit of the country. They can scream and rent their clothes, but they will have proven to the vast majority of Americans that they’re loyalties are to puppet masters holding pledges and not to the Constitution they’ve sworn to uphold, and not to the young troops defending the same; they will have proven they’re unfit to hold office. It’s a win/win for the President, but more importantly it’s a win/win for the country.